AmazingRibs.com shows how to cure a ham with an easy to make brine. Getting your cooker or smoker fired up with the BBQ Dragon is just as easy! If you cure and smoke a ham and serve it fresh it will taste better than the best commercial ham you’ve ever tasted. There are two methods of curing, dry or wet. To dry cure, you mix up your salt and spice mix and coat the meat and hang it in a temperature and humidity controlled space. If you don’t do everything right, the meat will spoil. Wet curing is more even, thorough, reliable, and easy. Before you get started, I recommend you read my article on the Zen of hams, my article on cooking ham on the grill, and my article on the Zen of salt for background. You will need a five gallon food grade bucket . It must be food grade if it is plastic, and if it is metal in cannot be aluminum. If it is not food grade, you can use five gallon food grade bucket liners if your bucket is not food grade . A very clean beer cooler will also work. Optional add-ins. Three or four stalks of lemongrass is nice. So is dill. About the pink curing salt. You can substitute more table salt, but the meat will not have the typical rosy color when cooked, it will be tan. It will taste only slightly different, but it will not keep as long in the refrigerator. 1) Remove the skin and most of the fat. You can use the skin to make cracklins. 2) Put 1 gallon of the water in a pot and add all the ingredients except the ham. Boil for a few minutes until the salts and sugar dissolve. Chill. 3) Get your 5 gallon bucket and add the remaining 2 gallons of cold water and the brine you boiled. Stir. 4) When the brine is chilled, inject the meat in multiple locations with the liquid part of the brine and put it back in the bucket and submerge it. Click here for more on injecting and injectors. If necessary, weight the meat down under a tupperware container filled with water. Put the bucket in the refrigerator and let the meat cure for 10 to 14 days. It should not smell funny or look cloudy or develop a scum. 5) If you don’t plan to use it immediately, smoke it at 325°F until it is 165°F in the deepest part. You can glaze it in the last hour if you wish, but I wait until I am ready to cook and serve it to glaze it. My favorite glazes are Chris Lilly’s Spicy Apricot Glaze or Danny Gaulden’s Brown Sugar Mustard Glaze. Make sure it doesn’t burn. You can refrigerate it for up to two weeks. If you vacuum seal it it will keep longer. Cooking will take 6 hours or more depending on how thick the meat is. Leftovers can be stored in the refrigerator for a week or so, or frozen. You can cut slices and grill ham steaks, or just warm it in the oven. The reason we cook at 325°F is to prevent the stall which will happen at lower temperatures. 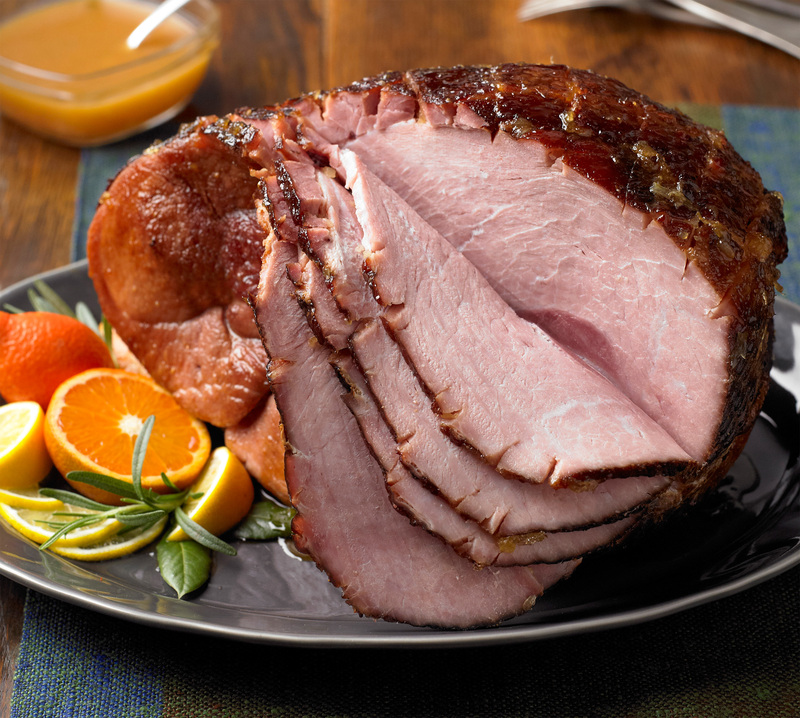 If you want to serve it immediately, smoke the ham at 325°F until it is 145°F in the deepest part of the center. This will take up to 5 hours depending on the meat’s thickness. During the last hour, paint it with a glaze. Make sure it doesn’t burn.